This post has nothing to do with law, unless you are a lawyer who likes to bike or hike or run or ski or sail or do any kind of outdoor activity. 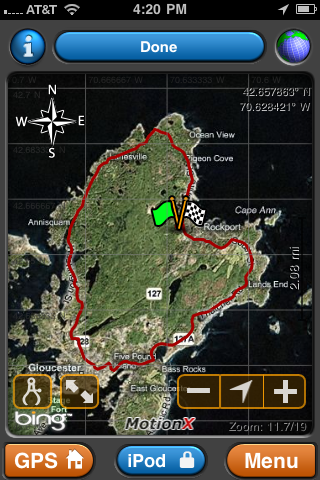 I like to bike and hike and I’ve been looking for a GPS app for my iPhone that would track my routes. Look for these in the app store and you’ll fine any number of them. I tried a couple with mixed results. Then I tried MotionX-GPS. 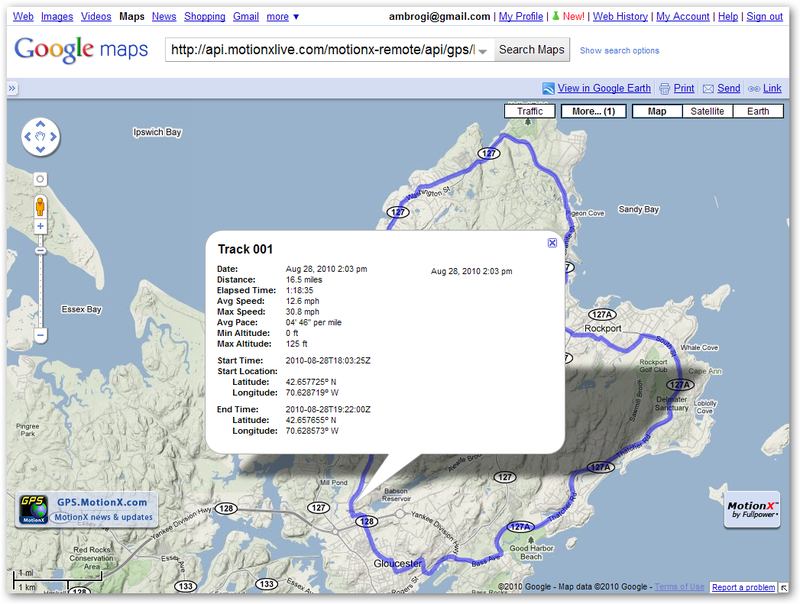 I’ve now used it several times to track both bike rides and hikes, and it’s worked flawlessly. MotionX tracks your time, speed, distance and altitude. It shows ascents and descents and degrees of gradients. All of this is recorded and can be stored. 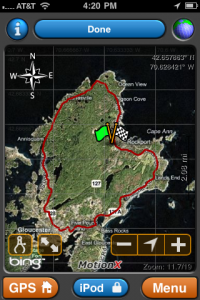 You can also mark and save waypoints and photos along the route. You can view the numerical data or see it on a map. You can save up to 101 different tracked routes on your phone (with the paid version). You can also share your routes by e-mail and on Facebook and Twitter. The first photo on the left shows just some of the basic information saved from my ride today. You can see that I traveled 16.5 miles at an average speed of 12.6 MPH and hit a maximum speed of 30 MPH. If I could scroll down, you’d see graphs showing speed and altitude at two-minute intervals throughout my trip and data showing the total of my ascents and descents for the trip. The next image shows the map of the route I traveled as it appeared on my iPhone. Of course, you can zoom in and out. You can also select whether to use maps from Google, Bing or MotionX and set other orientation options. 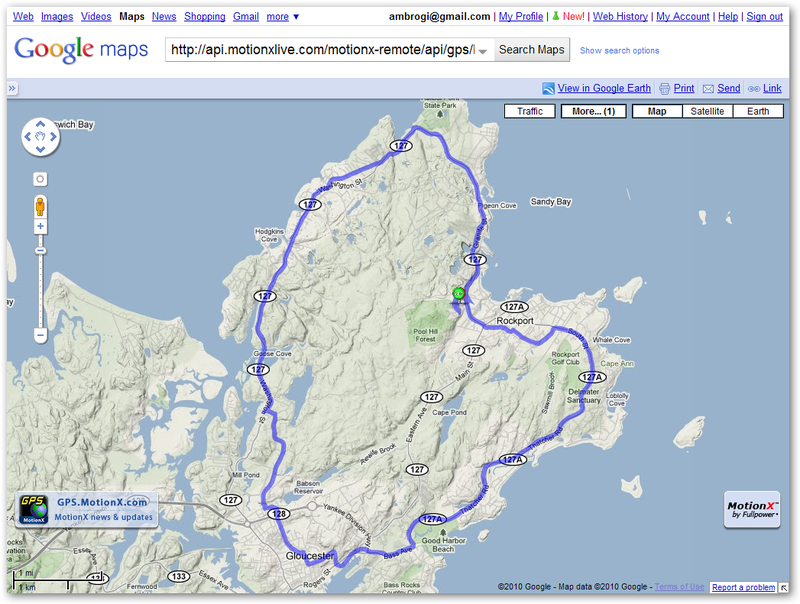 When I was done, I e-mailed myself the saved route and opened it on Google Maps on my laptop. The third image shows the map of my route as it appeared there. The final image shows the same map with the pop-up displaying all the saved route information. I did all this using the free version, called MotionX GPS Lite. But having now tested it a number of times with consistently accurate results, I just bought the full version, which is $2.99. MotionX has a variety of functions that I have not covered here. If you’re interested in this type of product, go to its website and read more about it.